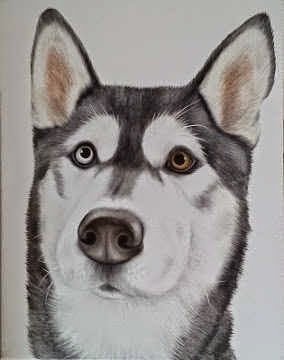 Sparky's Auntie commissioned me to do a pet portrait of this stunning Husky. As she lives up in Scotland and only sees him when she comes down to visit her brother she wanted to be able to see Sparky everyday so decided to treat herself and get a portrait of him after meeting me at Woofstock back in September. The first thing that struck me was his eyes, Huskies commonly have different coloured eyes, a trait called 'heterochromia' of the eye and Sparky is no different with one pale blue and one brown eye. I also love his adorable expression in this picture and can only guess he is waiting patiently for a biscuit!